Lush Cosmetics is a cosmetics line that focuses on producing safe and natural beauty products. They have recently come out with a revolutionary idea: toothpaste that isn’t in paste form. The concept behind this product, named Toothy Tabs and Tooth Powder, is to give consumers an option for a natural toothpaste that still gets the job done. Toothy Tabs: What Are They? Toothy tabs are the vegan tablet forms of toothpaste in the new line. Each bottle of the product, priced at $10, has a decent amount of tabs that should last a few weeks if used daily. Lush recommends to use the tablets by crushing them in your mouth and then continuing to brush as you would normally. The line has come out with seven different types of the Toothy Tabs: Bling!, Dirty, Miles of Smiles, Limelight, Smile, Boom, and Oral Pleasure. Bling! is a tablet that has been dusted with edible gold glitter for that fancy feeling. These tablets advertises a refreshing citrus flavor along with stimulating guarana seed powder to energize you for the day! Dirty is a simple white tablet that most resembles the original toothpaste we all know and use. Dirty’s defining feature is a classic spearmint flavor with a few essential oils thrown in there. Miles of Smiles is another white tablet. But this one has the promise of a strong triple mint flavor derived from the combination of english peppermint, organic peppermint and wild mint. Limelight is a green and yellow marbled tablet. It promises to give you a powerful citrus and mint flavor from lemon, lime and spearmint oils. One of these tablets also has baobab fruit powder that turns your mouth into a fizzing toothpaste party! Sparkle is another tablet with a citrus flavor from grapefruit oil and lemon peel but with a surprising twist: black pepper. This unique addition serves to give a warming, tingly sensation during your experience. Boom! is a black tablet that is made of detoxifying ingredients such as powdered charcoal and gunpowder tea. Through the combination of black pepper oil and ground chili, a cola flavor and a warming feeling is created for this tablet. Lastly, Oral Pleasure is a magenta tablet with a sweet and tart flavor of passion fruit. Rose oil and tantalizing electric daisies also give this tablet a tingling feeling when used. Tooth Powder: Better Than Normal Toothpaste? 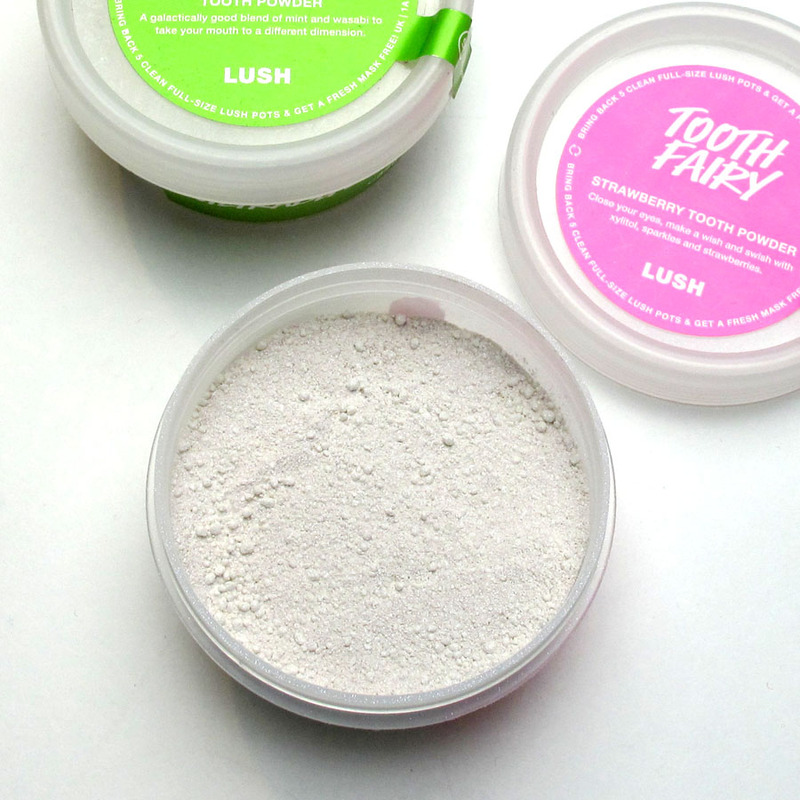 Tooth Powder is a vegan alternative to regular toothpaste and basically an already crushed form of the Toothy Tabs. It’s also the same price. Lush recommends using the powder by dabbing your damp toothbrush into the pot and brushing as you normally would. The product has three different options: Tooth Fairy, Ultrablast, and Atomic. Tooth Fairy is a pink tooth powder with a sweet strawberry and lemon flavor with a little luster in the mix for added sparkle! Ultrablast is a light green powder that promises and extra minty flavor with a twist. It’s composed of peppermint, spearmint and lavender for ultimate freshness. The twist is wasabi powder that provides a refreshing cooling sensation. Atomic is another green powder that is advertised as a ‘spice market’. This specific Tooth Powder contains coffee, cloves, cardamom, cinnamon, ginger and white pepper in order to provide a spicy tingle. So… Are They Worth Ditching Our Regular Toothpaste? If you’re up to feeling adventurous with your oral hygiene routine or just for trying something new, go for it! Each product is highly rated on Lush’s website, all flavors are either three stars or above. Buzzfeed recently posted a video in which employees tried a few of the new products. The reactions were very mixed between dislike and moderate liking. I say if you’re feeling brave enough, why not try it? Go forth and have fun brushing your teeth like a hipster!